Head of the Royal Archives and noted authority amongst historians, Dr. Mog is an enthusiastic teacher with many students, but there is one keeper he trusts above the rest with handling the current crisis. Wields rods and staves. A master of a variety of arcane arts, able to use rare black magic, white magic, and summoning abilities. 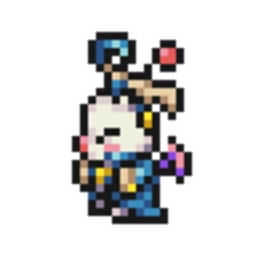 Tetra Break(Dr. Mog) Temporarily lower the Attack, Magic, Defense, and Resistance of one enemy a moderate amount. Gain a small amount of Magic and Mind when a book is equipped. Restore significantly more HP with white magic abilities, and deal significantly more black magic damage. Reduce black magic damage taken a small amount. Moderate chance for black magic abilities and summoning abilities to trigger twice. Small chance for white magic abilities to trigger twice. Magus Sphere S. Lv.1 +3 MAG Complete the Black Mage Sphere. Sage Sphere S. Lv.1 +3 MND Complete the Black Mage Sphere. Devout Sphere S. Lv.1 +3 MND Complete the Red Mage Sphere. Complete the White Mage Sphere. Dr. Mog Legend Sphere S. Lv.1 +10 RES Complete the Magus Sphere.